Self-Defense & Empowerment for ALL! Dynamic and practical safety skills for all ages presented in positive and supportive formats. Voted Best of the Bay! These courses are not "fear-based" - they're fun! All Studio Naga's self-defense courses can be specially formatted for your school, business or community group. Ladies Fight Night: Self-Defense & Street Safety! Be a superhero in your own life! This practical streetsmarts class combines effective self-defense with simple street-awareness techniques and powerful verbal skills. The class includes a celebratory drink and dreamy cupcakes – because taking care of yourself deserves a reward! For tweens, teens and up. Sign-up by using our contact page, then pay at the Naga Store, or call to reserve your place. $30 per person, or $50 for two! GrlQuake camps, classes and workshops deliver powerful messaging and skills to girls 6 and up. GrlQuake Power Self-Defense classes cover verbal and phsyical safety skills. The classes are tailored for specific ages: for older girls and young women, dating safety is discussed as well as anti-bullying interventions, the concept of "fierce friendship" and the importance of speaking truth to power. We are now offering six-week ongoing teen classes. These can be tailored for your groups: soccer teams, church groups, or scouts. Call for more info. GrlQuake Power Camp is a weekend workshop covering self-defense, personal empowerment, confidence building, and leadership skills through movement, art, discussion and phsyical challenges. (Includes a night hike!) GrlQuake 2019 is May 3-5: registration is open, this sold out in 2018 so sign up early. Call for more information or to schedule! Assess situations rapidly and choose effective strategies accordingly. Non-verbal, verbal, and physical techniques give participants access to safer, more empowered lives. Hour of Power is available for class durations of one to ten hours. 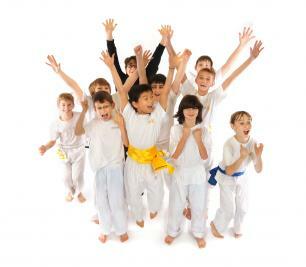 POWER UP Self-defense for Kids! Self-defense for boys and girls ages 4-11. Build Confidence! Be strong! Age-appropriate games and skills introduce basic self-defense and safety strategies in a fun format. A powerful course for moms (or other care givers) and daughters. Powerful safety strategies for the whole family. Learn important life skills while having fun! A special course for 'tweens and teens! Learn powerful verbal strategies for dating and peer challenges, and effective streetwise self-defense.